The Connecticut Driving Test - Will You Pass? Are you taking your Connecticut driving test shortly? I made a Driving Test outline to make it easier for my teenagers to study. Maybe this information will help you too. Put these notes into practice immediately, so they will become second nature to you. You need to read the Connecticut DMV manual for the written test too, because there is some stuff, like the "hand signals," you're going to have to look up. So go to the DMV near you, pick up an application for a driving test, get a CT manual, fill out the application, choosing your location and time for the driving test, (the earlier, the better) and then mail it with 40 bucks by check or money order, to get an appointment. 2. Set the Parking Brake when you park at the DMV, turn off the radio and lock the car. 3. Take note of what's parked around you, when you come out with your driving inspector to the car for the test. He will check the car for flaws, and will give you your registration and insurance card back. 3. 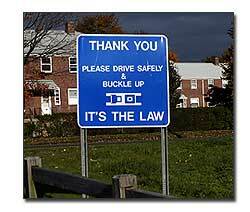 Make sure the inspector has his seatbelt on! This is what is expected of you while driving. Maintain a SPACE CUSHION from other vehicles around you. Do not run a yellow light. Do not put your vehicle at unnecessary risk. Do not go past the speed limit. Know - how to work the parking brake, wipers and washer, heater and defroster, headlights, highbeams and parking lights, horn, and other instruments. Be familiar with the warning lights. When you return from the driving test. Don't forget to set the parking brake! Proof of name and date of birth. You need a Birth Certificate and 2 other forms of ID. You need the Appointment letter and verification of your current address, such as utility bills, mortgage papers or the DMV appointment letter envelope. You must have a Social Security Number on your application.